WXLIVE! climate summary for 2008 - Happy New Year!! Here's a recap of 2008 Climate Data as taken from WXLIVE! - my personal weather station in Bartlett, TN. Official data from the NWS for Memphis Int'l Airport will be available in the next day or two. 2008 MWN Recap and a huge thank you! It's hard to believe that 2008 is almost in the books! What a great year I've had in the weather business. My "daily" weather job has been challenging, educational, and rewarding. My "side job" with MemphisWeather.net (MWN) has also brought me a great deal of satisfaction. MWN celebrated it's 5th anniversary in existence in April and WXLIVE! hit the 3-year mark in July. I've launched several new products and services in 2008, including WXLIVE!-Text, a mobile version of MWN, MWN StormView Radar, and this blog! I've also hit new records for viewers, so I know that my efforts are appreciated. Thanks to each and every one of you who has been a part of it! Even though I enjoy doing it, I don't do all of this for myself - I do it to fill a need and because I have people who look to the site for their weather information. Thank you! My web stats for this year show that over 600 of you visited MWN more than 1,400 times on December 15th (the ice storm that narrowly missed Memphis), which is very close to the same number that visited on February 5th (the day the tornadoes roared through the metro area) and March 7th (in the middle of the 4-7" snow storm)! 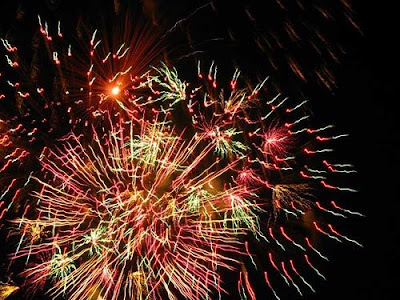 The total number of visits to MWN for 2008 will approach 26,000 by midnight on January 1, 2009! As for this blog, this is post #161 of the year. By tomorrow night, the blog will have been seen by about 2,700 visitors since I started keeping stats in late July, with over 4,000 pages viewed. Dec. 15-16 were the two biggest days with over 500 visits during that 48-hour period. Once again, I offer my thanks to you for your patronage and encourage you to pass the word on to your friends, family, and co-workers that MemphisWeather.net and The MWN Blog are two sites that every Mid-Southerner needs to have bookmarked as their source for weather information. Thanks for a fabulous 2008! I already have some tricks up my sleeves for 2009, so don't go anywhere! Happy New Year! Temperature records are falling across the region. As of 1pm, Memphis Int'l has broken the 119-year-old record of 76 degrees with a new record high of 77! Wind gusts have reached 46 mph at the airport as well. In Jackson, TN, the previous record high of 70 degrees has been obliterated by 5 degrees already, with the potential for another couple degrees of warming yet. Wind gusts have also reached the 40 mph mark in Jackson. The severe weather threat remains in place, and in fact has been upgraded for locations north and west of Memphis. A MODERATE RISK is now in effect for northern AR, southeast MO, and southwest IL. The timing of the squall line (which is moving into central AR at 1pm) is still on track for a 6-9pm arrival in the metro area. Stay tuned to NOAA Weather Radio and commercial TV or radio, plus MemphisWeather.net, for the latest on the severe weather threat. I expect a watch box will be issued for the region late this afternoon. Several weather-related items of note this morning, and since I haven't written about the weather in a few days, I'm behind! Yesterday's high of 73 was 1 degree off the record here in Memphis. And this morning's balmy low of 67 would shatter the record for highest minimum temp of 59 if we didn't have that pesky front coming through this evening, which will drop the daily low below that record by several degrees. High temps today will be in the mid 70s with a little sunshine. The record is 76, so once again we'll get close. I am expecting 74, but with more sunshine than expected, 76 may be in jeopardy! We are also under a WIND ADVISORY until midnight tonight as it will be another very warm, very windy day. Wind gusts could approach 40 mph during the daytime hours. Make sure that outdoor objects are buttoned up or you could lose them! Driving high-profile vehicles could also be difficult today due to the wind gusts. The other note for today relates to the possibility of severe weather as the front passes through this evening. The Storm Prediction Center has placed the metro area under a SLIGHT RISK of severe weather, with the greatest threat being damaging wind and small hail as a squall line passes. The line will likely pass through the city between 6-9pm tonight. Conditions will quickly improve after the front passes, with skies clearing after midnight. The New Year's week forecast looks pretty good right now with highs generally in the 50s and lows in the 35-40 degree range, which are both slightly above normal. Dry conditions are expected Sunday through New Year's Eve. A frontal system will move through Thursday or Friday (timing of this one is still a little fuzzy), so expect some rain late in the week and cooler temps headed into next weekend. High wind in Reno, NV during the early morning hours on December 19th left the NWS NEXRAD radar in... well... "less than ideal" condition. This would be deemed "radar failure." Check out the photos below of the aftermath of an estimated 140 mph wind gust! More information can be found here. 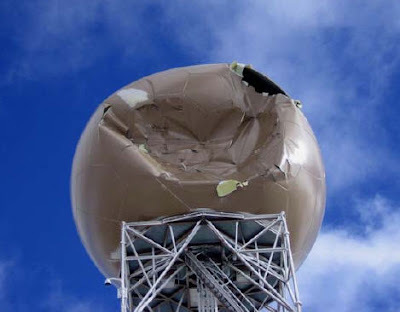 Some very interesting meteorology went into the conditions that caused the destruction of this radar, which are described briefly in the link above. There were "lee waves" occurring downwind of the Sierra Nevadas that morning which caused intense vertical motion that was picked up on satellite. The lee waves were the likely cause of the extreme gusts. The fact that the radar is located at almost 8,300 feet above sea level contributed. It will take quite a while for this radar site to be back in working order, but in the meantime, forecasters at the Reno NWS office will have to resort to using surrounding radar sites for their radar data. 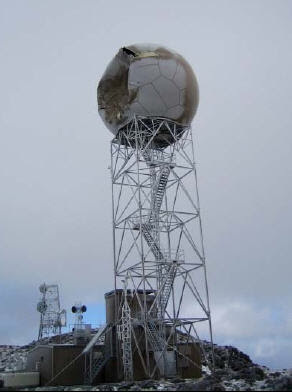 I've seen pictures of one other such radar failure in the past decade - the Laughlin AFB radar near Del Rio, TX radar that was hit by a presumed downburst with 90-100 mph wind on May 24, 2001. Bitter cold air has settled in over the region this morning as Arctic high pressure is centered over MO/AR and will move east-northeast into the Ohio Valley by this evening. Temperatures are running about 15-20 degrees below normal with wind chills in the single digits to teens. The morning low at MEM today was 14 while the high will be near 30. As the high shifts east, the next storm system will begin to encroach from the west with clouds increasing this afternoon. The nighttime hours will be dry, but shortly after daybreak Tuesday, some very light precipitation could begin to fall from mid-level clouds. Fortunately the low levels of the atmosphere will start off very dry tomorrow, but there is a slight chance that some precip could reach the ground between 7-10am as very light freezing rain or sleet. I put the chance of this at 20%. By 10am, temperatures will be warming on an increasing southeasterly wind, the lower levels will saturate, and rain will become widespread by afternoon as highs reach to near 50. Tuesday night will be wet and very windy, with a chance of t'storms by Wednesday morning as a cold front approaches. Temps Tuesday night will actually rise slowly through the 50s. Christmas Eve will start off wet and windy, but the cold front should pass through Wednesday afternoon, bringing an end to the rain and allowing temperatures to fall back through the 50s. It should be dry for most people's Christmas Eve worship services on Wednesday evening. Christmas Day looks mainly dry right now, but the aforementioned front will be moving back north as a warm front, bringing a low chance of light rain by late afternoon and evening. Sorry, but no White Christmas this year! The unsettled pattern will continue into the early part of the weekend with above normal temps. Illustration above courtesy Dewey Bryan Saunders. As the winter solstice occurred this morning at 6:04am CST, winter was ushered in with unreasonably (in my opinion) cold temperatures as Arctic high pressure settles overhead. The high today occurred at midnight as cold air poured into the Mid-South behind a strong front that pushed through last evening. Mid-day highs are running around 30 degrees with wind chills in the teens thanks to a cold north wind at 10-20 mph. Tonight, the wind will calm only slightly, which in actuality is a good thing, as it will keep temps from totally bottoming out. With dewpoints running in the single digits, a calm night could send temps that low. Thankfully the breeze will keep the atmosphere mixed just enough that lows should *only* reach the low to mid teens (he says with sarcasm...). ;-) Tomorrow's highs will be similar to today, only starting from a lower point - so expect afternoon temps to again be in the 20s area-wide with a high near 30 under mostly sunny skies. Fortunately, temperatures won't drop much Monday night as skies cloud up and a chance of precipitation moves in by morning. I'll try and write more on that tomorrow, but right now it appears that there could be a wintry mix possible early on Tuesday before temps warm enough to change it to all rain by mid-morning. Stay up to date with the latest forecast from MemphisWeather.net. For those of you curious about what it's like inside the Memphis SuperHub of FedEx Express - the world's largest air express cargo company - see the video below. This time of year is considered "Peak" at FedEx, when the company will process the its highest volume of packages. Even with the economy down, millions of packages will flow through the SuperHub five nights a week. A five mile perimeter. Parking slots for 175 aircraft. 300 miles of conveyor belts. That's the Memphis Super Hub. With over 4,000 employees during the day and 8,000 at night, this unbelievable facility keeps Memphis and FedEx connected any point on the globe. Supporting the largest air cargo fleet in the world, the Memphis Hub handles about 3.3 million packages per day. So, what are the historical chances of a white Christmas in Memphis? Good of you to ask! 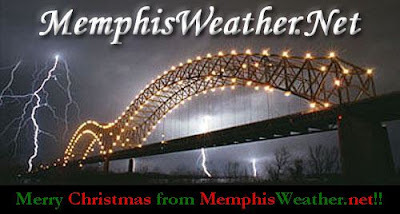 The average high temperature on Christmas Day in Memphis is 50 degrees, while the average low is 33. The only Christmas in recorded history (since 1872) that measurable snow fell ON Christmas Day was 3.5" in 1913! A trace of snow was recorded in 1975, 1980, and 1992. As for snow on the ground on Christmas Day (a white Christmas), the greatest recorded snow depth was 10" in 1963. Other years in which the snow depth was at least 1" on Christmas Day were 1962 (2"), 2004 (2" - remember that one? ), and 1998 (1"). A trace was present on the ground in 1966, 1980, and 1990. Christmas Day is in my extended forecast beginning today, so keep an eye on it for our forecast (not climatological) chances. It is somewhat unusual, though not as much in the wintertime as in other seasons, for the temperature to rise during the overnight hours, but how about doing it for three nights straight? That may be exactly what we see, as a warm front pushing up from our south and abundant cloud cover are working in tandem to cause temperatures to hold steady or rise for almost 72 hours! At Memphis Int'l Airport, beginning last night (Tuesday) at 11 pm local time, temps have been steady or rising each hour. I expect that trend to continue overnight tonight as abundant cloud cover has helped keep the lid on temperatures today and a warm front pushes a little closer to the area overnight. They will continue rising tomorrow, to a high at least in the upper 40s. Thursday night, the warm front should make it all the way through Memphis, so I expect that temps will again hold steady in the evening before rising overnight as a stiff south wind kicks in. By Friday, a little sun might peek through and highs should reach well into the 60s. This would make a stretch of almost 3 days (Tuesday night to Friday afternoon) that temps will have held steady or risen every hour. Temperatures across the metro are now above freezing, ranging from 33-35F at 2pm. StormView Radar shows the precipitation has pretty much departed the area and the Weather Service allowed the Freezing Rain Advisory to expire on schedule at noon. With highs just a few degrees above freezing and low overcast conditions with virtually no wind overnight, some drizzle will be possible that could freeze if temps drop to 32. I'm not certain that the heart of the city will see 32 as temperatures should remain nearly steady, but suburbs could see the freezing point, including Autobahn-connah (Bill Morris Parkway). If any precip falls early in the morning on Wednesday, I would avoid that stretch of road once again! The scenes from this morning were just ugly... After tomorrow morning, I expect we won't see freezing conditions again for at least several days. Many school districts across west TN, outside of the metro area, will be closed today. Visit WMC-TV (wmctv.com) for the latest information. Our friends just to the north are not nearly as lucky however, as a major ice storm has hit northeastern Arkansas, southern Missouri, and western Kentucky. Significant accumulations of sleet and freezing rain have fallen (up to an inch in many locations) and it will be a while before they climb back above freezing as the stationary front to the south of MEM takes until Wednesday to lift back that far north. So what to expect for the city of Memphis and it's suburbs? As I had forecast yesterday, and am still sticking to, chances for precipitation today reside at about 30% and any precipitation that falls will be very light. The temp should rise above freezing at around noon, so it's going to be a cold day and the wind blowing at 15mph won't help. For tonight, things are still a little tricky. It appears the precip chance is slightly higher, but the temps are going to be an issue. They should hold steady in the mid 30s, and that is what I currently call for. However, there is some indication that they could drop back to 32, or perhaps not rise higher than 33-34 during the day, which would mean some areas, particularly outside the city proper, have another shot at seeing light freezing rain. Will hold off on that until we see how today progresses. I should have a better idea on this afternoon's forecast update around 3:00. Things definitely get better on Wednesday with highs well into the 40s - and 60s are expected late in the week before the next big cold front! At 10pm, the National Weather Service has downgraded the Ice Storm Warning for the metro area to a Freezing Rain Advisory, due mainly to the lowered expectation for the amount of ice expected. Less than 1/4" of freezing rain, possible mixed at times with sleet, is expected by noon Tuesday. Also at 10pm, the I-40 and I-55 bridges across the Mississippi River are at a standstill thanks to a light coating of ice and several wrecks. Check the road conditions links to the right for more info. As depicted in the image from MWN StormView Radar in winter mode on the metro view at 8:09pm, freezing rain was falling in Shelby County thanks to a passing shower. It passed right over the WXLIVE! sensors in Bartlett, where it immediately froze due to a surface temperature of 29F. StormView nailed the precip type and appears to be doing a great job of picking up the areas of freezing rain and sleet. To the northwest of the city where cold air is a bit deeper, it is showing sleet. Jonesboro has just over 1/2" of sleet on the ground. If you experience winter weather, feel free to drop a comment on this post! I'd love to hear from you. I've also added some links to the top right of this blog for area road conditions, school closings, and the latest storm reports from the National Weather Service. The scenario appears to be unfolding as forecast so far. Please exercise caution if you must be on the roads from now until noon tomorrow. Conditions have set up nicely for a freezing rain event overnight into early Tuesday morning along the I-40 corridor in the Mid-South. Surface temperatures have dropped as forecast and are now at or slightly below freezing across the area. The current temperature profile (going up in the atmosphere) has sub-freezing temperatures through the lowest couple of thousand feet, and then a pronounced warm layer (well above freezing) above that. Therefore, as moisture moves back into the region late this evening, it will fall through the warm layer, becoming rain, and then hit the cold layer. Some precip could form into ice pellets (sleet) prior to reaching the ground, but most of the precip will not actually freeze until it reaches the surface. Thus - freezing rain. Fortunately (if there is a positive to this event), the amount of precipitation expected during the night in the metro area should be less than 1/4" based on the computer model that seems to have the best handle on things right now. This should limit some of the collateral damage from the ice (like power lines down, branches down, etc. ), but will still create hazardous driving conditions late tonight and for Tuesday morning's rush hour, particularly on bridges and overpasses. Pavement temperatures (except bridges and overpasses) are running around 40 degrees right now, so it will take some precipitation falling on the roadways before they collect a glaze - bridges and overpasses are not this warm and will freeze first. Please exercise extreme caution if you must travel prior to about noon tomorrow, when temperatures will be back above freezing. Be sure to stay up to date with the latest conditions and forecast at MemphisWeather.net. Visit WMC-TV (wmctv.com) for the latest information. 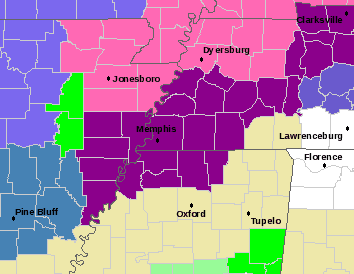 An Ice Storm Warning has been posted for the Memphis metro area and I-40 corridor in west TN and east-central AR this morning, which is in effect from noon until 6am Wednesday. From the NWS: "SOUTHERLY WINDS ALOFT ARE FORECAST TO INCREASE AND OVERRIDE THE SHALLOW COLD AIR IN PLACE... A CLASSIC SETUP FOR AN ICE STORM." The Arctic front has arrived and temps are quickly falling - 19 degrees between 4:30am-6:00am at the Memphis airport. There could be some light freezing rain this afternoon in the city, but the big story could be overnight tonight, when up to 1/4" of ice falls on the city. This could be enough to down some power lines and cause some tree damage and is enough to create dangerous traveling conditions by Tuesday morning. Further updates are coming... stay tuned to commercial TV and radio, NOAA Weather Radio, and MemphisWeather.net for the latest on the developing winter weather scenario. This will be the third potential shot for winter precipitation in Memphis in the past couple of weeks, and this may perhaps be the best chance of the three. A strong Arctic front is sweeping towards the Mid-South tonight and will move into the Memphis area tomorrow morning around daybreak/rush hour. This front will cause temps to fall from near 60 overnight to the 30s by tomorrow afternoon in the city with wind shifting from strong southerly to a stiff northwest breeze Monday morning. Rain will commence late this evening, but much of the rain is expected to fall after the frontal passage, as the temps are falling. The critical temperatures that will be monitored are in the lowest 2-3,000 feet of the atmosphere. Temps above that (up to several thousand feet) will actually remain warm, promoting rain. However, by early afternoon, those low level temps will fall below freezing. As this sub-freezing layer gets deeper, a little sleet could start to mix with the rain after 3pm. Surface temperatures will still be above freezing, but in the 30s. As the surface temperature approaches freezing around 6-8 pm, the potential for freezing rain increases. Temps will remain around freezing all night Monday night and up until about 9am Tuesday, so any precipitation that falls could freeze on contact from 6pm Monday to 9am Tuesday. Rain amounts are not expected to be significant, but one-tenth of an inch of ice is possible by Tuesday morning in the metro area. This would be enough to coat bridges, overpasses, and other exposed surfaces. For this reason, the National Weather Service has issued a Freezing Rain Advisory for Memphis (and much of the Mid-South from I-40 north) beginning tomorrow through Tuesday morning. The MWN forecast will remain updated on a regular basis throughout the potential winter weather event. Stay tuned! THE POTENTIAL FOR WINTER WEATHER EXISTS EARLY NEXT WEEK. A STRONG COLD FRONT WILL USHER MUCH COLDER AIR INTO THE REGION MONDAY. TEMPERATURES WILL PLUMMET AROUND 20 DEGREES IN A SHORT PERIOD OF TIME FOLLOWING THE FRONTAL PASSAGE...CHANGING RAIN OVER TO FREEZING RAIN ON MONDAY NORTH OF THE MEMPHIS METRO AREA. BY MONDAY NIGHT...THE FREEZING LINE MAY SINK FURTHER INTO THE MIDSOUTH CHANGING RAIN OVER TO FREEZING RAIN FROM MEMPHIS NORTHWARD. THE FRONT WILL BEGIN TO LIFT BACK NORTHWARD DURING THE DAY ON TUESDAY...ALLOWING TEMPERATURES TO WARM BACK ABOVE FREEZING AND CHANGING FREEZING RAIN BACK TO RAIN. MINOR ICE ACCUMULATIONS ARE POSSIBLE MONDAY NIGHT. IF MORE ICE DEVELOPS THAN IS CURRENTLY FORECAST...ICE ACCUMULATIONS COULD CREATE HEAVY LOADS ON TREE LIMBS AND POWER LINES...POSSIBLY CAUSING THEM TO FALL. IN ADDITION...VERY DIFFICULT DRIVING CONDITIONS MAY DEVELOP. IF ROAD ICING DOES OCCUR...PLEASE REMEMBER TO ALLOW EXTRA TIME TO REACH YOUR DESTINATION. DETAILS CONCERNING THE EXACT TIMING...LOCATION...AND AMOUNTS OF WINTER PRECIPITATION WILL BECOME MORE CERTAIN AS THE EVENT DRAWS CLOSER. WATCH FOR LATER FORECASTS AND STATEMENTS FROM THE NATIONAL WEATHER SERVICE AND MEMPHISWEATHER.NET. A wet week ahead, and maybe freezing precip? Enjoy this weekend, as it may be the last couple of dry days we have for a while! There will be only a little sun, but a lot of wind, the next couple of days as temperatures climb into the 50s today and 60s on Sunday thanks to strong warm southerly wind. I expect a Wind Advisory will be needed Sunday as gusts occasionally approach 40 mph. By Sunday night, scattered showers will break out ahead of a potent cold front. Those showers, and wind, will continue into Monday with the front passing through sometime Monday afternoon. Behind the front, temps will drop precipitously, from near 60 at lunch time to the 40s by rush hour and into the 30s in the late evening. Unfortunately, rain could continue into Monday night and early Tuesday, setting the stage for possible freezing rain during that period. Freezing rain because the temperatures above the lowest 1000 or so feet will be way too warm to support snow or sleet. Freezing rain is defined as rain that falls as a liquid then freezes on contact with surfaces that are below freezing. It is also potentially the most dangerous form of winter weather due to its ability to accumulate quickly, forming a slick coating of ice on bridges, overpasses, trees and power lines, and vehicles. I am not expecting large amounts of ice by any stretch in the Memphis area just yet, but northeast AR and northwest TN should definitely be preparing for this possibility. It's still too early to determine whether the air will be cold enough and enough rain will fall in the metro area to promote accumulating freezing rain. For the rest of the week, the front will hang around the area all week, continuing the rain chances throughout the week. Models are having a difficult time with its placement and any upper-level waves that might move through, triggering rain events, so you'll just have to stay tuned! I'll do my best to keep the MemphisWeather.net forecast updated throughout the weekend, and definitely into next week, so that you have the latest and greatest information from the most accurate source in Memphis! 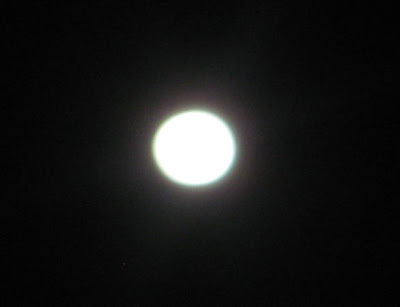 Did you get a glimpse of the perigee full moon last night? It was pretty cool. Very bright, very large, especially on the horizon. Anti-climactic? Perhaps a little, but still a sight to see. I tried to take some pics, but it's difficult with a digital point-and-shoot with something that far away. It's always smaller in the picture than what you see through the naked eye. Here's the best one I got, cropped down some. Remember that tonight is the night for the biggest full moon of the year - literally! See my previous blog on the subject. Moon rises at 4:46pm, sun sets at 4:48pm. Sky conditions should be optimal. Snow in the Deep South! A strong, and still developing, low pressure system headed northeast across AL this morning is dragging in very cold air on it's back side, producing SNOW for portions of Mississippi, Alabama, and even Louisiana! 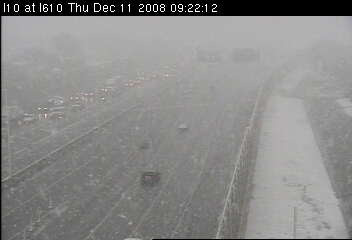 Check out the traffic cam image from I-610/I-10 in New Orleans about 9:30 this morning! Yes, that is New Orleans! The latest observation from the airport indicated 33 degrees and heavy snow, with visibility reduced to 1/8 mile! Checking other southern Louisiana cams, there is snow on the ground from New Orleans to Baton Rouge to Lafayette, and even some visible in Lake Charles, near the Texas border. New Orleans experiences snowfall only on rare occasions. A small amount of snow fell during the 2004 Christmas Eve snow storm. On Christmas Day, a combination of rain, sleet, and snow fell on the city, leaving some bridges icy. The last significant snowfall in New Orleans fell on Dec. 22, 1989, when most of the city received 1–2 inches. Looks like the Memphis area has missed it again though. MWN StormView radar (image at 9:43am above) shows the back edge of the rain shield is just east of the immediate metro area. While it could pull slowly back to the west for a few hours this morning, the rain will be shifting east with the aforementioned low by noon time. A slight rain chance exists for the city this morning. Tomorrow (Friday) evening, Dec. 12, might be a good time to take in a little astronomy. According to NASA, the moon will be at perigee (it's closest point to the earth) at the same time that it is full, promising a spectacular view (provided there are few or no clouds) of the largest full moon of the year! 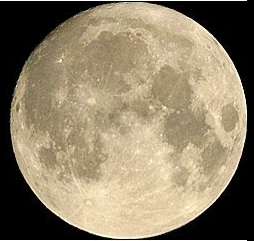 It will appear 14% larger and 30% brighter than other "normal" full moons. Not only that, but it will rise here in Memphis at 4:46pm, 2 minutes before official sunset! So, be sure to check the eastern sky between 4:45-5:15pm Friday for a large full moon rising during twilight. I'll try and post a few pics on Saturday. Gullywasher yesterday... and what about the snow? Two weather topics on everyone's mind today... the rainfall totals from yesterday and the snow potential for tonight. #1. Wow, what a rain! Check out the map below for a look at 24-hour precipitation reports from this morning for the eastern U.S. Note the 1.5-5"+ totals across the Mid-South, Tennessee Valley, and lower Mississippi Valley. These reports come from the CoCoRaHS network of trained precipitation observers. Reports from inside Shelby County are all between 3.50-3.75" while totals to our east are generally about 0.50-1.00" higher! At WXLIVE in Bartlett, the automated weather equipment recorded 2.85", while the manual "official" rain gauge right next to it reported 3.59" for the event. The difference is larger than I usually see between them (usually the automated gauge is ~10% under, depending on the wind). That's still the most rain recorded in one calendar day since WXLIVE was installed in June 2005. The 3.48" recorded at the airport on the 10th was also a record for the date. Wow!! #2. As cold air filters in today, holding temps in the upper 30s in the metro area, a developing low pressure system over the northern Gulf of Mexico will strengthen and move northeast tonight. The Mid-South will be on the back (cold) side of the low and precip will wrap around the low overnight as it moves northeast. Anything more than a tenth of an inch should remain east and south of the city and there is potential for some accumulating snow in northeast MS and eastern areas of west TN (nearer the TN River). However, in the metro area, expect mainly light drizzle or a light shower with temps in the mid 30s. Some snowflakes could mix in between 3am-10am but no accumulation is expected. Sorry school kids! What do you have to say about yesterday's rain? How about the chance of snow? Leave me a comment! As advertised, rain and some t'storms are overspreading the region this morning ahead of a developing low pressure system that will pass to our west and a strong cold front. Temperatures this morning are running in the low to mid 50s and wind is gusty out of the south. Expect more of the same throughout the day with wind gusts as high as 35-40 mph, prompting the issuance of a Wind Advisory. Rainfall totals through midnight tonight will be in the 2-3" range, especially east of the MS River, so minor flooding in areas normally prone to flooding will be possible. In addition, some thunderstorms this afternoon and through rush hour could be strong. The Storm Prediction Center has placed north Mississippi under a SLIGHT RISK of severe weather today. The best chance for strong storms will be just ahead of the cold front, which will pass through Memphis in the early evening hours. A few storms cold contain hail and damaging wind gusts, mainly south of the city. Following the cold front, much colder air will infiltrate the Mid-South with temps dropping overnight to around 40 by daybreak Wednesday, but not recovering much, if at all, during the daytime hours on Wednesday as a steady northwest wind pours cold air into the region. There is a chance of ...winter weather... (gasp!) Wednesday night/Thursday, again mainly to the south of the city. More on this in an upcoming blog. Stay tuned, and stay dry! It's not wonder so many people are sick this time of year! The weather just can't make up its mind. After a chilly weekend with highs lingering in the lower 40s Sunday, a large-scale storm system heads towards the Mid-South to start the work week. Strong southerly wind ahead of it will pump the Gulf moisture into the region beginning today and continuing in earnest overnight as the first drops of rain fall late this evening. Wind will increase with gusts over 25 mph this afternoon and possibly near 40 mph overnight, particularly after midnight when the rain should begin to fall steadily. A few elevated t'storms are also possible late in the night, particuarly west of the river. The warm air conveyor will keep temps from falling much overnight after highs today reach the upper 50s. For Tuesday, rainfall will be widespread and potentially heavy after noon through the evening hours, with upwards of 2"+ possible. In fact, parts of west TN and north MS have been identified as having a slight risk of flash flood-producing rains, where 3"+ could fall. See the NWS precipitation forecast for 6am Tuesday through 6am Wednesday to the left. Additionally, thunderstorms will be a better bet and the wind will continue to howl with gusts near 30 mph all day. Look for a high in the lower 60s. The cold front will move through early Tuesday evening, possibly with an associated line of storms, and temperatures will begin their descent back to below normal (even for December). Wednesday will continue to be cloudy with isolated showers and temps struggling to stay around 40-43 degrees. In fact, there's a pretty decent chance that northern suburbs may not see 40 on Wednesday at all. At this point it does not appear snow is in the forecast on the backside of this system - abundant moisture will move out before the air cold enough to produce snow moves in. BTW - did you catch the series of beautiful sunrises and sunsets over the past few days? See my blog from Friday about the "frozen sunrise." Though it was not frozen, the sunrise this morning was just as incredible, and Saturday night's sunset was also pretty awesome. Gotta love the wintertime cirrus that contributes to such a spectacular show! Ever seen a frozen sunrise? Sure you have, you've just never heard it called that! 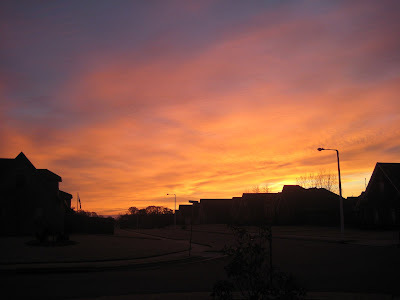 The Memphis area got to experience a gorgeous frozen sunrise this morning as high clouds (between 10,000-15,000 feet) wafted over the area on a strong westerly jet stream as the sun rose in the eastern sky. Temps were in the upper 20s - making it a frozen sunrise! I'm a fan of gorgeous sunrises and sunsets (see my MemphisWeather.net Photo Gallery for proof) and this morning's did not disappoint. It's just further proof that someone much greater than any of us is in charge. I would have missed it if it weren't for the orange glow coming through the east-facing windows, even with the blinds closed. The clouds were present over the entire region this morning - anyone else catch a glimpse? November ended drier and cooler than normal... here are some stats from Memphis International and Bartlett. Notice the pronounced heat island effect at Memphis, particularly with respect to average low temperatures. TSO and Christmas lights - a great combo! Taking a look at StormView radar at 4:00pm, isolated light showers are beginning to pop up in northeast AR ahead of a strong winter cold front. Along the front, stretching from north-central to west-central AR, Little Rock NEXRAD is detecting a narrow band of rain, with some embedded heavy downpours. These showers will increase in intensity and coverage over the next several hours as the front sweeps east. Look for the front to pass through the metro region between 9-11pm this evening, with some showers ahead of it, moderate to heavy rain right along the front, and continuous light to moderate rainfall for a couple of hours after the front passes. Rain totals of 0.75"-1.00" are possible tonight. In addition, the passage of the front will signal an end to today's "balmy" 60+ degree weather, with temps dropping up to 15 degrees in the hour or two after the front passes and bottoming out in the morning in the mid to upper 30s! Very little recovery will take place tomorrow with highs in the 40-45 degree range. Abnormally cool weather will continue for some time, based on the latest information from the Climate Prediction Center, which shows us to remain well below normal temperature-wise for the next couple of weeks. See the map above for Dec. 10-16 temperature probabilities that gives us a 50-60% chance of below normal temps. The eastern 2/3 of the U.S. will remain under the dominance of an upper-level trough which will serve to push cold Canadian-influenced air into the eastern U.S. Look for the pattern to remain similar to this past week with a couple of "mild" days separated by cold blasts behind potent cold fronts. Tomorrow will be one of the "hills" between the "valleys" as we top out near 60 with strong, gusty southerly wind. The cold blast arrives tomorrow evening, accompanied by moderate to possibly heavy rain for a few hours between 5-10pm, and a sudden switch to strong northerly wind dropping temperatures during the evening hours - possibly on the magnitude of 15 degrees over the course of an hour or two. We will then stay cold again for a couple of days with highs in the mid 40s at best on Thursday and Friday. Recovery takes place over the weekend, with another strong front early Tuesday of next week. Check out the latest forecast from MemphisWeather.net. It seems appropriate to borrow a portion of a line from the late super-voice of the Memphis Grizzlies, Don Poier: "Only in ... Memphis." I'm referring of course to the recent snowfall (or lack thereof in certain areas of the Mid-South). Reports from across the region, including Jonesboro, Jackson, Nashville, Crossville, north Alabama (! ), and even as close as Cordova and Arlington, TN, indicate that light snowfall was widespread early Monday morning, and into the afternoon east of the city. I'm glad that those of you who live outside the city got to see some snow, because the airport officially recorded NADA. The city is always right on the line, whether it be the rain-snow line, the precip-no precip line, whatever. So, did you see any snow? Leave me a comment and tell me about it! StormView Radar detects first snow flurries! Looks like the snow flurries missed most of Memphis proper as temps hung out near 36-37, but according to StormView radar, light snow flurries were falling at 6:20 this morning across a decent portion of West TN and extreme northeast MS. The airport in Jackson, TN was reporting snow flurries and 34 degrees at the time this radar shot was taken. Notice the greens (drizzle/light rain) in the warmer metro area vs. the grays (light snow) farther out from the city. Sorry kids - no snowmen this time! Haven't changed my mind since yesterday afternoon with respect to the possibility of winter weather for late Sunday into early Monday. Still think that light rain Sunday afternoon will gradually change to light snow from north to south Sunday night. Northern suburbs could mix with light snow by late evening, while the city and points south will take a little longer - possibly midnight or later - as near-surface temps take longer to cool. I'm not expecting any accumulations in the city, as temps should bottom out in the mid 30s and the ground surfaces will be a bit too warm. However, a dusting to maybe 1/4-1/2" is possible in northern suburbs on grass/bare ground and exposed surfaces by Monday morning. Roads will be just fine as the snow melts on contact. Flurries should come to an end during the morning hours on Monday. Stay up-to-date with the latest forecast at MemphisWeather.net. All the buzz right now seems to be about the possibility of snow late this weekend. I'll remind all of you that we live in MEMPHIS, which if you look it up in the dictionary means "the geographic location at which snow to the north becomes rain." OK, so there IS a possibility, and a rather decent one actually, that we could see some snow flurries or perhaps a light snow shower in the area - if you wake up in the middle of the night Sunday night to look out the window. If we're lucky, some flakes will still be falling Monday morning. It will definitely feel cold enough to snow with wind chills in the 20s Monday morning and temps in the lower to mid 30s. But, don't expect schools to let out, in fact don't expect to see any accumulation here in the metro area. As for the rest of the weekend, look for on and off showers throughout Saturday and Sunday, nothing real heavy,or even moderate probably, and temps in the 40s to around 50. Monday will be mainly dry, but cold with highs still in the 40s. A quick warm-up is in store for Tuesday. If you're like this old bird (I mean the one on the table), you have a lot to be thankful for today! Enjoy the warmish weather while we have it, folks! The mid 60s today and tomorrow may be the last time you see them for some time! Medium and long-range models are beginning to come around to a major pattern shift this weekend that will take us well into December. A strong trough diving out of Canada appears poised to land square on top of the region Sunday and Monday, while reinforcing shots of cold air line up upstream. Of course, the devil is in the details, but this morning's 6am model run show the potential for some moisture to work into the cold air on Sunday afternoon through early Monday. Surface temps will be critical as it will be cold enough aloft to provide frozen precipitation, albeit light. Looking at the map from the GFS model below, the temp at about 5,000' will be well below zero and there is definitely some moisture in place (light greens indicate light precip amounts). Will the initial batch of moisture make it into the area? Will the thermal profile in the lowest couple of thousand feet be enough to melt the precip and bring us a cold rain? How long will this cold snap last? A couple of interesting blog posts, with more analysis, have been recently written by my good Meteorology bud Eddie up at JacksonWeather.net (Jackson, TN). I'd encourage you to take a look at these, and stay tuned! 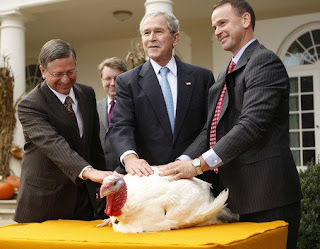 Lastly, I want to wish you and yours a very happy and safe Thanksgiving! I'm thankful for all of you who choose to read this blog and use MemphisWeather.net on a routine basis! After a cold day with a high of only 41 degrees at the Memphis airport and at WXLIVE! in Bartlett, temps are plummeting this evening. At 6:40pm, the WXLIVE! sensor is down to 29 degrees as wind has gone calm and skies are clear. Under strong Canadian high pressure, the dewpoint is 14, which means very dry air is in place and temps will continue to fall, probably into the upper teens, by morning. In the city center, I expect a low around 23-25. As shown in the surface analysis for midnight tonight (below), that high will be centered right over the TN Valley, setting up ideal conditions for a very cold night. As the high moves east, a light southerly wind will commence, which will help warm temperatures up tomorrow back into the lower half of the 50s. Looking ahead, the best rain chances in a while will move in Sunday night as a cold front tracks through the Mid-South. The air behind this front is not nearly as cold, so temps will remain in the 50s to near 60 for highs through much of next week. Right now, another front and associated precipitation move towards the area by week's end. I expect that the rain will likely hold off until at least Thanksgiving night, so while Black Friday may be wet, Thanksgiving should be pleasant. The best way to survive a winter storm is to plan and prepare for the hazards of winter weather. Although some winter storms develop quickly and with short notice...most events can be planned for. If power is lost...never use a gasoline or diesel-powered generator inside the house...in the garage...or any other enclosed space. Generators can cause carbon monoxide to build up to deadly levels in enclosed spaces. Operate such generators outdoors only. Another winter threat is house fires. December...January...and February are the leading months for house fires in this country. More than one-third of fire deaths occur during the winter months. -Wood stoves should be installed...used...and maintained in accordance with instructions from the manufacturer. Use of a stove board will protect the floor. Only wood should be burned in the stove. -Kitchen ranges and ovens...charcoal grills...and hibachis should never be used for heating. This concludes this week's series on winter weather, brought to you by MemphisWeather.net and the Memphis office of the National Weather Service. Winter weather awareness week has brought one round of cold weather already this week. Early this morning, another cold front moved through and cold air is once again settling over the region on a brisk northerly wind. Temperatures leveled out around 50 early this afternoon and will fall back into the upper 20s tonight with a steady north wind continuing overnight. Tomorrow will be another day like Tuesday when the high was only in the mid 40s - only perhaps a couple of degrees cooler. The coldest night of the fall is on tap for Friday night! Temps in the "urban heat island" will fall into the mid 20s, while a few spots in rural areas outside the city could see a low in the upper teens Saturday morning! South wind Saturday will help warm it back into the lower 50s by mid-afternoon. The next rain chance doesn't come until early next week, but temps are not forecast to be nearly as cold behind the front early in the week as the past two have been. Normal highs this time of year are near 60 while lows are typically in the lower 40s. Below normal temperatures will thus continue into next week. Today's topic is winter precipitation types. Snow -- snow forms in the clouds and remains as snow all the way to the ground. It most commonly takes the form of snowflakes...which are the familiar six-sided ice crystals. It may also fall in the form of snow pellets or snow grains. Snow flurries are most commonly seen as a few snowflakes falling...although visibilities can be reduced at times. In the Mid-South...the term snow flurries is used to indicate that no accumulation is expected. 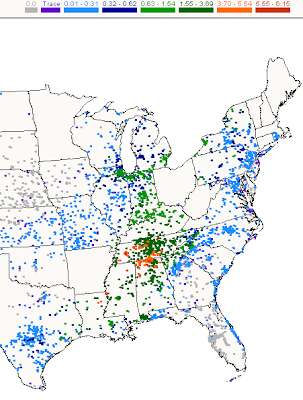 Snow showers is a term not often used in the Mid-South. In this type of precipitation...the snow falls at varying intensities over brief periods of time. Accumulation may occur...especially during moderate to heavy snow showers. Blowing snow most commonly refers to snow that is already on the ground and is lifted into the air by the wind. In the Mid-South...heavier snows most commonly occur when cold air is already in place over the region and a strong upper level low pressure system moves out of the southwestern United States. The low serves to pull moist air northward into the cold air. Light snow or snow flurries can also occur in the cold air that follows the passage of an Arctic cold front. Sleet - sleet consists of pellets of ice. In fact...for people who have trouble with the difference between sleet and freezing rain...it may be easier to associate sleet with its technical name...which is ice pellets. For sleet to form...snow begins falling from the clouds but then goes through a layer of above-freezing air thousands of feet above the ground. This causes the snow to change to rain. Then...the rain goes through a layer of below-freezing air...usually at least two to three thousand feet thick...and the precipitation turns into pellets of ice. Sleet typically occurs in a fairly narrow band. This band usually moves...but at times may remain nearly stationary...resulting in accumulations of sleet. In the Mid-South...sleet most commonly occurs in a narrow band between an area of rain to the south and an area of snow to the north. Freezing rain -- this weather phenomenon is sometimes called glaze...because of the glaze of ice it puts on surfaces at the ground. Freezing rain most commonly occurs when precipitation falls from the clouds as snow...then goes through an above-freezing layer...which turns the precipitation to rain. Then...the rain reaches the ground where temperatures are below freezing. The rain then freezes as it hits exposed objects. In the worst cases...everything becomes coated with a layer of ice. 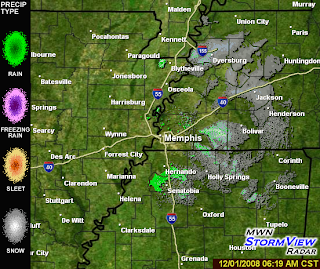 In the Mid-South...freezing rain commonly occurs as an Arctic high pressure system begins to move away from the state. In this situation...cold air is still lingering at the ground...but warmer southerly winds from the Gulf of Mexico begin bringing moisture back over the top of the cold air. Since the air at the ground has not warmed above freezing...the rain that falls freezes on the ground and other objects. Freezing rain...and its cousin freezing drizzle...often develop during the late night hours...creating icy conditions for morning rush hour. Freezing fog -- while this is not precipitation falling from the clouds...it is another winter weather hazard. Freezing fog typically develops on clear...calm nights when temperatures are below freezing. Fog forms and freezes...usually on bridges...overpasses...and other elevated roadways. It can create quite a surprise for motorists...due to the presence of clear skies overhead. Frost -- frost describes the formation of thin ice crystals on the ground or other surfaces in the form of scales...needles...feathers...or fans. Frost forms when water vapor in the air turns directly to ice crystals on an object. The temperature of the object must be below freezing for frost to occur. However...frost is sometimes seen on the ground when official temperatures are reported to be above freezing. This is because the official temperature is taken about five feet above the ground...where the air can be a few degrees warmer than the temperature at ground level. Make checking the latest weather reports part of your travel plans so you can avoid storms. Carry a NOAA Weather Radio along to tune into local weather information 24 hours a day. Fully check and winterize your vehicle before the winter season begins. A last reminder...a Winter Storm Watch means that winter weather is possible...a Winter Storm Warning is when winter weather has begun or is about to begin. Start your preparations now for the safest winter season possible and stay tuned to the forecast. Frostbite causes numbness and white or blue-tinted skin and occurs most commonly in the fingers...toes...ears...and nose. Hypothermia...an abnormally low body core temperature...is caused by prolonged exposure to cold. Hypothermia can occur indoors as well as outside. Body functions slow to a dangerously low level. Symptoms include slurred speech...incoherence...drowsiness...poor coordination...a slow heart beat...uncontrollable shivering or no shivering at all. To avoid hypothermia...keep your clothes dry. Wet clothing loses all insulating value and should be changed as quickly as possible. Mittens and a warm hat are necessities. The body loses about 50 percent of its heat through the head...so whether you are outdoors or inside an unheated home...day or night...a hat will go a long way in helping you stay warm. 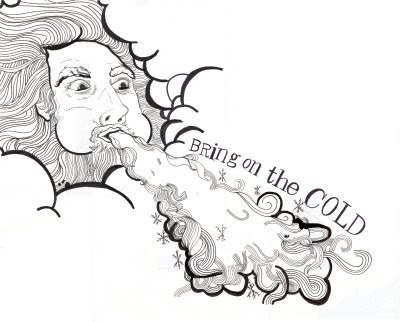 Wind chill is based on the rate of heat loss from exposed skin caused by the combined effects of wind and cold. As the wind increases...heat is carried away from the body...driving down the body temperature. Remember that animals are affected by wind chill as well. Avoid overexertion...such as shoveling heavy snow or walking in deep snow. The strain from the cold and hard labor may cause a heart attack. Wear loose...light-weight...warm clothing in several layers. Trapped air is an insulator. Layers can be removed to avoid perspiration and subsequent chill. Outer garments should be water repellent and hooded. Always cover your head...as you can lose half of your body heat through an uncovered head. Be prepared for the storm by listening to NOAA Weather Radio...commercial radio or television for the latest winter storm advisories. NOVEMBER 17TH THROUGH 21ST IS WINTER WEATHER AWARENESS WEEK IN THE MID SOUTH. PEOPLE ARE ASKED TO TAKE SOME TIME AND PREPARE FOR THE UPCOMING WINTER SEASON. HERE ARE A FEW TERMS THE NATIONAL WEATHER SERVICE USES WITH WINTERWEATHER. WINTER STORM WATCH...A WINTER STORM WATCH MEANS THAT DANGEROUS WINTER WEATHER IS POSSIBLE AND YOU NEED TO BE ALERT TO CHANGING WEATHER CONDITIONS AND AVOID UNNECESSARY TRAVEL. WINTER STORM WARNING...A WINTER STORM WARNING MEANS SEVERE WINTER WEATHER HAS BEGUN OR IS ABOUT TO BEGIN IN YOUR AREA. STAY INDOORS DURING THE STORM. IF YOU MUST GO OUTDOORS...SEVERAL LAYERS OF LIGHTWEIGHT CLOTHING WILL KEEP YOU WARMER THAN A SINGLE HEAVY COAT. WEARING GLOVES AND A HAT WILL PREVENT LOSS OF BODY HEAT. COVER YOUR MOUTH TO PROTECT YOUR LUNGS. UNDERSTAND THE HAZARDS OF WINDCHILL. WALK CAREFULLY ON SNOWY...ICY SIDEWALKS. THE NATIONAL WEATHER SERVICE REMINDS YOU TO BE PREPARED BEFORE WINTER STORMS STRIKE. HAVE EXTRA BATTERIES FOR FLASHLIGHTS...FOOD AND WATER...EXTRA MEDICATION...FIRST-AID SUPPLIES...AND BLANKETS FOR ADDITIONAL WARMTH AVAILABLE IN CASE OF EMERGENCIES. BE READY FOR WINTER STORMS BY LISTENING TO NOAA WEATHER RADIO OR YOUR LOCAL NEWS STATION. DURING WINTER STORM EMERGENCIES...STAY TUNED TO NOAA WEATHER RADIO FOR INFORMATION AND EMERGENCY INSTRUCTIONS. POST EMERGENCY TELEPHONE NUMBERS BY THE PHONE AND KEEP ENOUGH SUPPLIES IN YOUR HOME TO MEET YOUR NEEDS FOR AT LEAST THREE DAYS. PREPARE FOR WINTER WEATHER BEFORE IT ARRIVES. MWN StormView Radar is now live! StormView Radar has two "flavors" - a regional view and a metro Memphis view. Fully-interactive and driven by the latest Flash technology, you'll find it easy to use and packed with features! 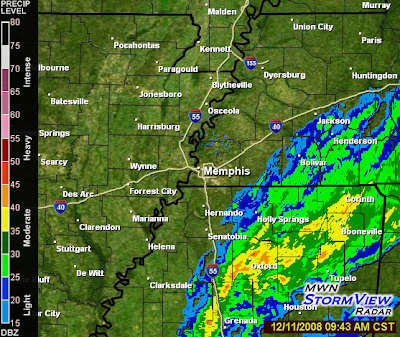 Make sure you visit MemphisWeather.net and select StormView from the Radar menu. Its first images (one of which is shown above) are of cold air advection showers over portions of the metro area, which are moving quickly southeast in the wake of a strong cold front that passed through last evening. As a side note, if you operate a small or medium-sized business in the Memphis area and want to have your banner ad on both StormView pages, you can sponsor MWN StormView Radar. Send me an email or click the banner on the StormView page. COMING TOMORROW -- SATURDAY NOV. 15!! Just another reason MWN is "all the weather you need for Memphis and the Mid-South..."
The next big addition to MWN will be a Flash-based interactive radar - where YOU have control over what you see. Zoom in to your area, add storm tracks and severe weather warnings, overlay radar-based severe weather indicators, see how much rain has fallen across the area, even see where winter precip is falling! "All the Weather You Need for Memphis and the Mid-South"
Hurricane Paloma (or "dove" in Spanish, how ironic is that?) has punished the Cayman Islands overnight, passing over Cayman Brac (where the calm of the eye was noted for a few hours)and almost directly over Little Cayman, and sideswiping Grand Cayman, after intensifying in a matter of two days to a destructive Category 4 storm. Paloma has put 2008 in the record books once again as the only noted hurricane season to have major (Cat 3+) storms in five separate months - July (Bertha), August (Gustav), September (Ike), October (Omar), and November (Paloma)! 2005 was the only other year with majors in 4 separate months (no major hurricane in November 2005). Paloma is also the second strongest November hurricane on record, behind only Lenny (1999). I've included a few satellite images, and one infrared loop, of extremely dangerous Paloma below. The visible satellite, and zoomed VIS shot above, are the first space shots of the morning after the sun rise over the storm. Here are the latest details: As of 9am CST, Paloma was located 130 nm/ENE of Grand Cayman with sustained wind maxing out at 140 mph. The storm is moving ENE/9 mph and on this track will cross the central Cuban coast overnight, still as a major hurricane, with a devastating storm surge of 17-23 feet. The mountainous Cuban landmass, as well as increasing shear, are expected to do a number on Paloma and it will emerge back into the Atlantic in a much tamer form, though at least tropical storm force conditions are likely for the central Bahamas. The extended forecast calls for the low-level center of the storm to stall out between the Bahamas and Cuba, while the upper-levels get sheared out and continue northeast. Cool weekend on tap; extended looks wet! Astrong cold front moved through the Memphis area late yesterday afternoon bringing much cooler and breezy weather today. High pressure will dominate through the weekend with a reinforcing shot of cool air Saturday evening. That will keep temperatures mainly in the 50s for highs this weekend with lows dropping into the 30s each night, particularly in the suburbs. Widespread frost is anticipated Sunday morning and, if the wind goes calm, some places will see the freezing mark. Right now, I am forecasting about a 5 mph wind, so that may be enough to keep temps "up" in the mid 30s in the suburbs. For next week, another pattern change is coming as we start seeing Gulf moisture flow back into the region and with a very slow moving front and low pressure systems riding up along the front, we will be set up for perhaps more than one bout of moderate to heavy rain. The first comes Monday night and early Tuesday with cloudy skies and slight chances of rain lingering until another possible round on Wednesday or Thursday. Hopefully by Friday, the front will have moved through and cleard everything out in time for the weekend! Next week's rainfall totals could easily surpass 2" in many locations. Borrowing from a 1989 Milli Vanilli hit that reached the top of the charts, if you don't vote today, you can't "Blame it on the Rain!" A gorgeous day is setting up for Election Day across the Mid-South, and in fact a large portion of the country. The only weather problems of significance will be some showers and upper-elevation show showers in the Rockies and rain in the Mid-Atlantic from DC south to the Carolinas. Temps across the Mid-South will be in the 70s, nearly 10 degrees above average! This beautiful weather will last one more day, before a strong cold front and thunderstorms rumble across the Mid-South on Thursday afternoon and night. This system is currently winding up in the Rockies and will move into the flyover states tomorrow. The map below shows the risk of severe weather for Wednesday. As we head into Thursday, the lower Mississippi Valley, including Memphis, in under a SLIGHT RISK of severe weather, primarily for the low risk of damaging straight-line wind and hail. I expect a squall line to form to our west during the afternoon and move through the metro area during the evening hours. The probability of severe weather for Thursday and Thursday night is shown below. Check back tomorrow and Thursday for further updates and be sure to check MemphisWeather.net for the latest forecast. October is in the books, Daylight Savings Time has ended, and Election Day is tomorrow! Temperatures at Memphis International Airport were slightly below normal for October with an average high of 73.8 and an average low of 53.2. Precipitation was above normal by just over an inch. The airport received 4.34" during what is climatologically the driest month of the year. As for WXLIVE! in Bartlett, the average temperature was 59.7, which is almost 4 degrees cooler than the airport, thanks in large part to much cooler morning lows that we experience out in the suburbs. Precipitation was almost identical to the airport at 4.32", though my CoCoRaHS "official" rain gauge pulled in an impressive 5.78." It is located right next to the WXLIVE! station. Overall, October really was a great weather month. The pleasant days and cool nights are just what I like! The very mild weather of the past several days will continue for a few more as high climb well into the 70s. Low temperatures the past couple of morning have been lower than I expected, even dropping back into the 30s this morning in Bartlett. This is thanks to the very dry air in place and no wind or clouds overnight. As the next storm system draws closer, moisture will increase and a wind of a couple miles per hour will be steady through the night, which should help to keep those lows up a little higher than in recent mornings. Bottom line... great weather is on tap for Election Day 2008 on Tuesday, so make sure you exercise your right to vote, despite the expected crowds. Every vote counts! The next cold front is due to arrive late Thursday evening. This front will likely bring a round of showers and thunderstorms to the region Thursday afternoon or evening, followed by much cooler temperatures. Highs behind the front will once again be back into the low to mid 60s as we head into next weekend. The next big addition to MWN will be interactive radar - where YOU have control over what you see. Zoom in to your area, add storm tracks and severe weather warnings, overlay radar-based severe weather indicators, see how much rain has fallen across the area, even see where winter precip is falling! A couple of days of Freeze Warnings are past us now as temps are rebounding nicely into the 60s this afternoon. This morning's low was 28.5 at the WXLIVE! station in Bartlett, following a low yesterday of 30.3. 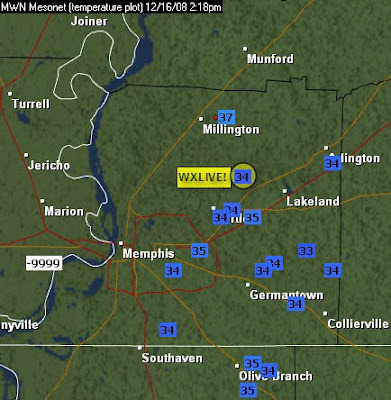 At Memphis Int'l Airport, the official lows the past two days were 34 and 35. Not quite to record territory but still very cold for late October. As we approach Halloween, temps are warming up as Canadian high pressure is replaced by a warmer airmass. Tonight's lows may still reach the upper 30s in the suburbs, but that should be the last 30 degree readings until at least the middle of next week. Highs are going to be reaching into the lower 70s for the weekend and trick-or-treat weather looks very pleasant - temps in the 60s with a few clouds. Though we've had some cool mornings so far this fall (today is no exception - low of 37 at the weather station in Bartlett this morning), the first real Canadian express cold front of the season is on track for an early evening arrival on Sunday. No precipitation (in fact no real cloud cover) will accompany the front, but its passage will be immediately noticeable as the winds switch to the north and gust to 15-20 mph and temps start falling after 6pm Sunday. So after a very nice Sunday afternoon with highs in the lower to mid 70s, I expect that we'll drop perhaps 20 degrees during the evening hours! Then, the coldest air of the season builds in on high pressure originating in Canada for Monday and Tuesday. Monday will be the coldest daytime temps as the mercury tops out in the upper 50s and a brisk northwest wind makes it feel even colder. Morning lows Tuesday and Wednesday will be well into the 30s with a widespread frost and perhaps a couple hours of near or a degree or two below freezing temps each morning. Fortunately, the weather moderates by mid-late week and trick-or-treating weather on Friday night appears to be very pleasant with temps in the 60s under mainly clear skies. We've just experienced a tremendous fall weekend weather-wise here in the Bluff City. Cool mornings (41 degrees for an average low at WXLIVE! in Bartlett the past 4 mornings) and pleasant afternoon highs (averaging 71 since last Thursday) have made for a very nice stretch of weather. According to the MWN forecast, that should last another 3 days with dry weather, highs in the lower 70s, and lows a little warmer - in the mid 50s - through Wednesday. That's when things will change. An upper-level low pressure system will develop at the base (southern end) of a trough now over the Pacific Northwest. By mid-week, that low will strengthen over the Plains and move slowly southeast towards the Mid-Mississippi Valley. The closed low is forecast to affect our region Thursday and Friday (see the image below valid Friday evening and note the concentric black circles and yellow/orange shading over the center of the U.S.). This low will mean plenty of clouds, rain, possibly a few thundershowers, and cooler weather for Thursday and Friday. By Saturday it will pick up speed moving east and we should again see high pressure return for at least the latter half of the weekend and early next week. The extended range guidance is indicating a more active pattern for late October-early November with below normal temps. Just got back today from an enjoyable weekend in Orange Beach/Gulf Shores, AL. Our family met my sister and parents there for a weekend playing in the sand and in the pool at our condo in Phoenix V. Click the link for a look at where we stayed, complete with live webcam of the beach! A pic from our balcony is below. We had a terrific time! My 6 year old daughter loved spending as much time in the water (the non-saltwater variety) as possible, while my 3 year old just played on the steps to the pool and in the sand. The last time we were at the beach was 5 years ago, so this was a good trip! The weather was interesting - warm and windy with no rain. In fact, it was very windy, with gusts in the 20-25 mph range during the day nearly the entire time, leading to pretty good waves ("moderate chop" or "Small Craft Advisory") and yellow flag conditions (which bordered on red flag) all 3 days we were on the beach. The second pic below shows a little of the surf conditions. Even the sand was being blown into the air pretty good (could see sandstorm-like conditions down the beach a mile or so). If you've been to the area, leave me a comment and tell me about it! Back home, after being out of touch with local weather for several days, I see a nice fall trough is on our doorstep with one more warm day before it really cools off late this week. Could we see a few 30s in cooler spots across west TN Saturday morning? At least it appears that the 80s may be done for a while after Wednesday! Autumn is probably my favorite season, so I'm glad to see 70s and sun in the extended forecast! Nice football (and marching band) weather! AT 1126 AM CDT SPOTTERS REPORTED FUNNEL CLOUDS 1 MILE NORTH OF CLOVERPORT IN HARDEMAN COUNTY TENNESSEE. THESE FUNNEL CLOUDS ARE ISOLATED AND NOT EXPECTED TO TOUCH DOWN. HOWEVER IF THEY DO TOUCH DOWN...WINDS ARE EXPECTED TO BE 50 MPH OR LESS. THE POTENTIAL FOR THESE SHORT LIVED FUNNEL CLOUDS ARE POSSIBLE THROUGH THIS AFTERNOON ACROSS NORTH MISSISSIPPI AND ADJACENT WEST TENNESSEE. THE NATIONAL WEATHER SERVICE IN MEMPHIS IS MONITORING THE SITUATION CLOSELY....BUT THESE FUNNEL CLOUDS ARE NOT OF THE VARIETY THAT IS ASSOCIATED WITH ORGANIZED SEVERE WEATHER IN THE MIDSOUTH. IF FUNNEL CLOUDS TOUCH DOWN OR IF A TORNADO WARNING IS ISSUED IN YOUR AREA...THEN SEEK SHELTER IMMEDIATELY. After a lengthy period of dry weather, I woke up this morning just before 5:00am to the sound of rain on the roof and thunder overhead! We had a torrential, albeit brief, downpour with 0.30" of rain falling in 10 minutes from a storm that had developed along a warm front traversing the region. It was also a very loud storm with nearly continuous lightning producing offspring-waking thunder! My 6-year-old, Grace, came trotting into our room a couple of minutes after I woke up (she hears thunder pretty quick, but not as quick as her Meteorologist pop) complaining about the continual cacophony outside her bedroom window. Fortunately, it was over almost as quick as it started and she was once again sound asleep under her Princess covers. Another line of storms (depicted in the radar image above) moved through a couple of hours later, around 7:00, and doused the entire city with roughly 3/4"-1" of precipitation. We've now had our break for the day and more storms have fired as a fairly slow-moving, but strong cold front approaches from the west. Current radar indicates a developing batch of storms moving through the metro area and extending south along the MS River. Very heavy rain and likely some small hail is falling from some of these storms. This pattern will continue into the evening hours, before becoming mostly scattered showers overnight. A low chance of rain still exists tomorrow as the upper level trough follows behind the front. At the least, cloud cover will keep temps in the 70s throughout the day. A clearing pattern will commence in the wake of the trough, with partly cloudy skies and warming temps expected Thursday through the weekend. Thanks to building high pressure, temperatures have warmed the past couple of days after a very nice week. Humidity will follow suit, creeping up the next couple of days as high reach the mid to possibly upper 80s. Thanks to higher humidity, morning lows won't be quite as cool as the past several days. This week, we will have a fairly significant trough move through mid week. Though it's origins in the Pacific mean there is not a lot of cool air behind it, it will pick up on the increasing moisture and bring us our best chance of rain in probably several weeks. Rain and some t'storms will be moving in from the west Tuesday afternoon and evening and it could be fairly wet through Wednesday, before tapering off with the passage of a "cool" front Wednesday night. Conditions look to be dry and warm on the backside of the trough for the end of the week and into the Fall Break weekend - for those who are tied to the local school's calendars. I'd also like to point out that this is my 100th blog posting since starting several months ago. Thanks to all of my readers for their comments, questions and support! Also don't forget to check out MWN Mobile when you get a chance at pda.MemphisWeather.net! Well, the time has come to officially unveil the MOBILE version of MemphisWeather.net!! As of 5:10pm on 10/4/08, MWN Mobile is online! To access the site from your PDA or other wireless device, go to http://pda.memphisweather.net. Initial features include current conditions from WXLIVE! in Bartlett updated every 5 minutes, Memphis radar (which is zoomable and can be looped thanks to the good folks at Weather Underground), and a fast forecast for anywhere in the world! Soon, I'll be adding the most accurate forecast for Memphis - the MWN Forecast - to the mobile site, as well as many of the other features available on the original. Now you never have to wonder what it's like back home when you're away on vacation or business trip! You can get the latest conditions from Bartlett anywhere, anytime using the power of the mobile web. Be sure to let your friends, co-workers, family, classmates, and even total strangers know about the new MWN Mobile @ pda.MemphisWeather.net! The front page of MemphisWeather.net tells you to check this blog for more information on the upcoming release of the mobile version of MWN. Well, here it is! Expect the first version of MWN Mobile to be released this coming weekend. I'll post the URL on the front page of the main site, as well as on this blog when it's released. Expect features included to be updated current conditions from WXLIVE!, radar, a quick search for weather across the country, and, if I can make it work by this weekend, my MWN forecast. The forecast WILL be there eventually, just don't know if it will make it in the first release. At some point, I hope to be able to include more of my regular site in the mobile format, so be watching for upgrades over time. Make sure you tell all your "friends on the go" that they will be able to get the latest weather info from MWN on their Blackberrys, Treos, PDAs, or other WAP-enabled device very soon! October has started off unseasonably cool and dry thanks to the weather pattern in the upper levels of the atmosphere. Take a look at the map below, showing the weather features at about 18,000 feet up. You'll see a large trough (or elongated low pressure system aloft) delineated by the dashed brown line extending through the eastern U.S. and a ridge (or elongated area of high pressure aloft) over the western U.S. We're on the backside of the trough, which is feeding cool Canadian air across the eastern U.S. Being on the back of th trough, our air at this level is feeding into the Mid-South from the northwest - what we in the business commonly refer to as "northwest flow." Typically, this will mean cooler a cooler airmass and the potential for fast-moving upper-level systems to dive around the backside of the trough and bring us some form of "weather." One of those is passing by this evening and bringing a few clouds, but nothing more due to very dry conditions below 18,000 feet. The trough will continue to affect our weather for the next 36 hours or so, until the ridge to the west scoots east and lands overhead. Ridges aloft typically mean warmer weather and dry conditions. So, the forecast calls for warmer temps (back into the 80s) this weekend as the ridge moves in, with no rain in store. By the middle of next week, the next trough, shown on the map over the eastern Pacific, will move in and bring a chance for precipitation. Now you know how upper-level systems can affect our weather down here on the ground!